MoonMarble.com - *Sara Sally LaGrand - "Pumpkin"
Art Glass → Contemporary Handmade Marbles → *Sara Sally LaGrand - "Pumpkin"
Handmade marble by Sara Sally LaGrand. Sara is a glassworking demonstrator at the Moon Marble Company. 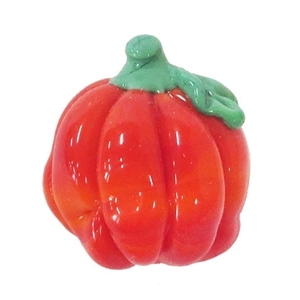 This quaint little sculpture resembles an orange pumpkin with a twisty stem. It is approximately 7/8" in diameter.